With the advancement in technology, many people are getting further and further away from nature. This is one of the reasons why 70% of the American population is on some medication. When all you do is work five days a week from 9 to 5, and with all the while worrying about what to do next, you are bound to have some issues and problems. That’s why everyone needs a hobby, something that will take you away from your usual struggles of daily life. That is where fishing comes in. And it is marvelous in every way. You can fish however you want, be it alone, away from the world, or with a friend or a loved one, just you and them, out on the water enjoying one of the simpler pleasures of life. Fishing can help relieve stress. It is more philosophical than most people would think. I went fishing against my will the first time. I sat there for what felt like hours, waiting for a bite. There were times when I was thinking about absolutely nothing, and then there were those times where I was making retirement plans. It is nothing short of a miracle that doing the same activity over and over for hours on end can be such a bliss. 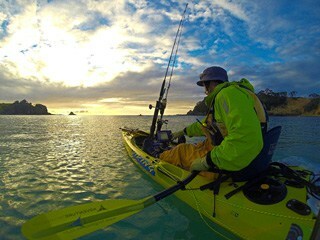 My personal favorite is going fishing in a fishing kayak. The freedom of going where ever you want, or just allowing nature to take its course and simply going with the flow, is amazing. Now, this aspect of fishing is very spiritual, but if you want, going competitive is very much an option. Although it certainly won’t be the cheapest option, it will be fun and worth every penny. The Intex Explorer K1 Kayak is a two-person inflatable kayak that is perfect for such situations. You can go to some of those out of reach spots and catch some big game, or enjoy the harsh beauty of nature from the safety of your kayak. And it is surprisingly cheap, costing less than a $100 right now. There are a lot of kayak accessories for fishing that will make your experience much better. Starting from things such as tops to protect you from direct sunlight, more comfortable custom made seats, different types of paddles that better fit your style, to anchors and stakes, navigation systems to make your experience more efficient, rod holders for times when your hands are otherwise busy, to even motors, coolers and fishing bags, all of them give a lot of options to choose from, personalize your kayak however you like, and even add more stability and safety with outriggers and live wells. Kayak fishing is on a whole new level. There are a lot of places that have been untouched by human hands, little lakes and water outlets that are just waiting to be found. The explorer in me is getting excited just writing this article. And although I was born too late to discover the oceans and too early to discover the stars, there is still something I can do.